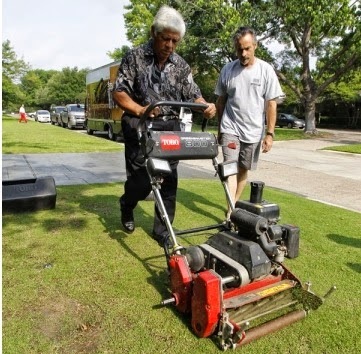 One day, shortly after joining the PGA tour in 1965, Lee Trevino, a professional golfer and married man, was at his home in Dallas, Texas, mowing his front lawn, as he always did. A lady driving by in a big, shiny Cadillac stopped in front of his house, lowered the window and asked, "Excuse me, do you speak English?" Lee responded, "Yes Ma'am, I do." The lady then asked, "What do you charge to do yard work?" Lee said, "Well, the lady in this house lets me sleep with her." The lady hurriedly put the car into gear and sped off. Now, I hope that my regular subscribers will forgive me for using the remainder of this week’s blog to try and clarify the situation regarding my weekly ‘Rhodes Rules School’ emails, as I am receiving an increasing number of queries from those that are out-of-sync with others they know who also receive them. ‘Rhodes Rules School’ started with the ‘Photo Series’ of 99 issues, in March 2010. This was followed by the ‘How Many Strokes?’ series of 99 issues, in February 2012. This was followed by the current ‘9 Questions About …..’ series of 99 issues, in January 2014. So, those that have been with me from the very beginning are now on issue No.19 of ‘9 Questions About …..’, whereas those that started subscribing only this week are on issue No.1 of the original ‘Photo Series’. At the end of each series, I make the complete set of 99 issues available for purchase in a single, convenient, downloadable document. All issues have been updated with the January 2014 amendments to Decisions on the Rules of Golf. If any subscriber wants to progress to a different series, so as to be in sync with friends or fellow club/society members, they can purchase the full set and ask me to advance them. Here are the links to purchase the full sets (price $9, €7 or £6). Finally, if you know of other golfers who have an interest in the Rules and are not yet taking advantage of receiving my free, weekly ‘Rhodes Rules School’ emails, or my free, weekly blogs on the Rules, would you please advise them of my email address, or email me with theirs. I can assure you that no-one is added to these two lists unless they respond positively to a verification email, confirming that they want to subscribe, there is no charge, recipients may unsubscribe at any time and I do not share contact information with anyone else. P.S. My thanks to all of you who have written to me expressing your appreciation for my content on the Rules. I really appreciate the feedback.